One of the best ways to green your holiday is to give eco-friendly toys. It’s that time of year again. The search for the best eco-friendly toys for our little ones is on. 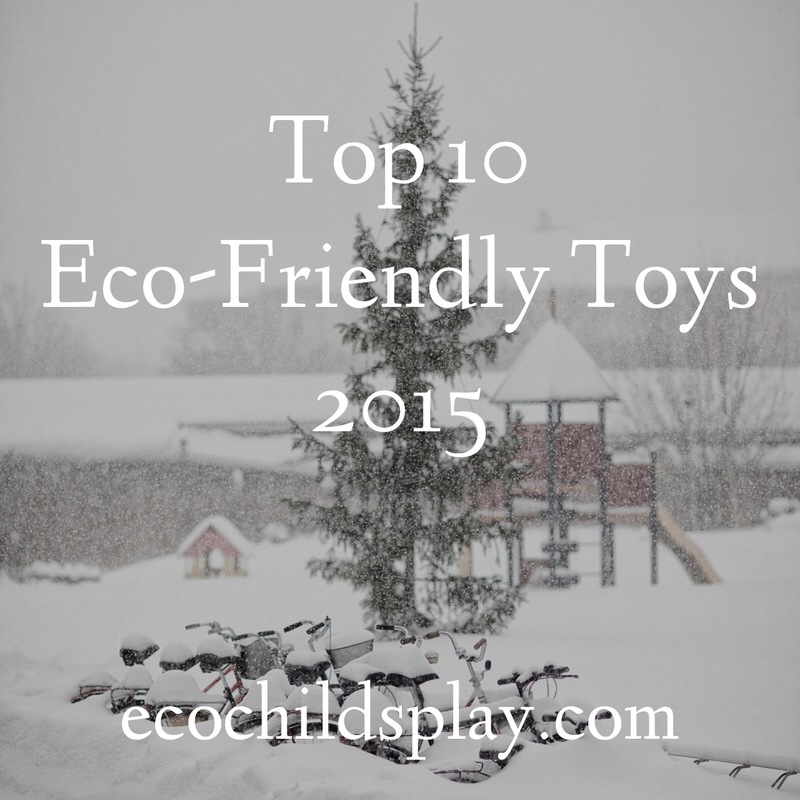 Here is a summary of the 10 best eco-friendly toys for 2015. None of these toys are on this list because of a company contacting or soliciting us for gift guide inclusion. This is simply our recommendation based on research. All of the toys selected support child development and vary in age recommendations. Just say NO to junk toys this holiday season! Most of these recommendations for eco-friendly toys are not made in China and are mostly plastic-free. I have purposefully left off companies that make recyled plastic toys, as I think we should be limiting our use of plastics recycled or not. There is a lot of energy used in the recyling. Eco-friendly toys are more expensive than cheap junk made in China, but they will last for generations. They are less expensive when you consider the social and environmental cost of their cheap counterparts. They range in prices from affordable to very expensive. My daughter discovered Shelter Pups. These incredibly cute eco-friendly toys are so realistic. They are made from 100% natural wool in the USA. ShelterPups aren’t your average plush animals: they are the softest, most realistic, cuddliest plush toy you’ve ever experienced. ShelterPups redefine the meaning of plush! Each stuffed dog and cat plush is handmade in the U.S.A. of pure, natural wool using the ancient art of felting. Our unique plush process creates unique, on-of-a-kind plush stuffed dogs that look real! It’s all in the materials! ShelterPups plush dogs and cats are made with ultra soft natural wool. The finest grade Merino wool is used to make our plush dogs. We literally went on a global quest to find the highest grade merino being produced today. Our super fine merino has unparalleled texture and creates an extremely soft and durable plush material. We can even custom blend many natural colors to make almost any coat pattern found on a real dog or cat. Felting! It’s a big part of why ShelterPups look different, and are so much more realistic, than any other stuffed animal you’ve ever seen. It’s also why our plush dogs and cats are so soft and so durable. All of our plush animals use felting to form their soft, huggable, nearly seamless bodies. The result: a beautiful plush dog or cat made from one of the healthiest, most natural fabrics on earth. Learn more about the ancient art of felting and how the magic really happens! Wool is the perfect material for creating a super soft, furry, fuzzy and durable stuffed plush animal. However, we absolutely do not want this to be at the detriment of sheep! Therefore we carefully screen our suppliers to ensure that our wool does not come from sheep that are subjected to mulesing or other harsh treatments. Safety is very important to us, but we don’t need harsh chemicals or flame retardants: wool is the ultimate natural flame retardant. Your traditional plush animal is made from synthetic polyester fabric. What’s worse, since that type of plush is petroleum based, it burns easily. To make those plush toys safer they are doused with nasty, toxic flame retardants. By contrast our natural plush dogs and cats are made from pure wool which is one of the best natural flame retardants. In fact, natural wool plush is almost impossible to burn! It’s another one of nature’s little miracles and our natural plush dogs and cats take full advantage of it. All “adopted” toys are issued rescue points that you then use to support real animal shelters. Even though the already made shelter pups are super cute, what I love is you can have your own cat or dog made into a toy! These customized, eco-friendly toys are so amazing! They are made from photos you send. This doll is so cute! Many organic, eco-friendly dolls are small in size. Not Sadie! She is 18 inches tall! I love that she is handknit and organic! I love her long braids too! Little girls will love Sadie’s happy smile and bright blue eyes, plus her thick long braids that will bounce and whirl as she dances. Handmade from organic cotton, Sadie has an heirloom quality that makes her a wonderful and memorable gift for a baby shower or little girl’s birthday. 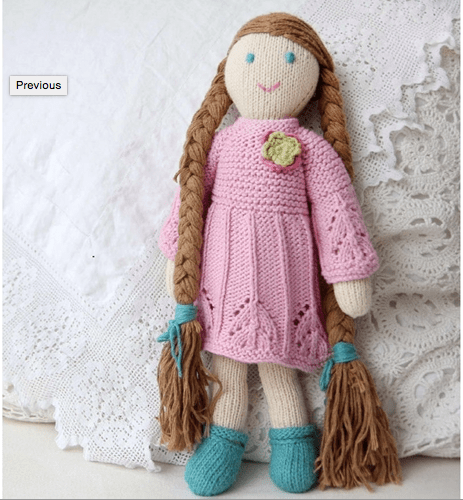 The kind of doll that will become a family keepsake to be handed down from mother to daughter or sister to sister, Zia and Tia dolls are made to be cherished. Sadie is dressed in a lively pink lace dress with a vintage leaf pattern. Blue Maryjane shoes and blue ribbons in her hair are the sweet details that make Sadie even more special. When my kids were little, Plan Toys was my favorite eco-friendly toy company. I trusted these toys were safe if they should end up in their little mouths. 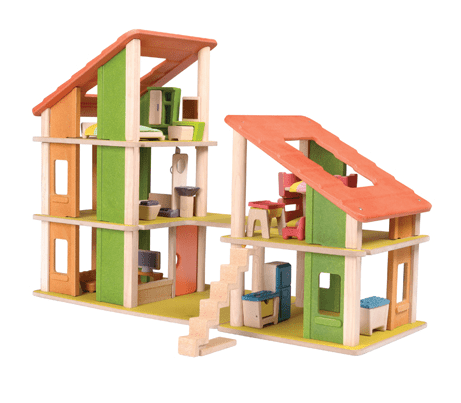 From sustainable wood to the glues and paints, Plan Toys is a leader in eco-friendly toys. The company keeps child development and the environment at the core of every product! Enjoy this beautiful dollhouse complete with furniture. The Chalet Modern Dollhouse comes with a unique design and furniture for every room. Sustainable Play: the Sustainable Way of bringing children closer to nature. PlanToys has been recycling the wood from expired rubber wood trees to create beautiful wooden toys that inspire children’s imaginations and promote a commitment to sustainable play for generations to come. Sustainable play is the foundation of how PlanToys cultivates creative minds and bring children closer to nature. With innovative design and high quality and safety standards, the company is the world’s leading green manufacturer of safe, eco-friendly and educational wooden toys for all children. 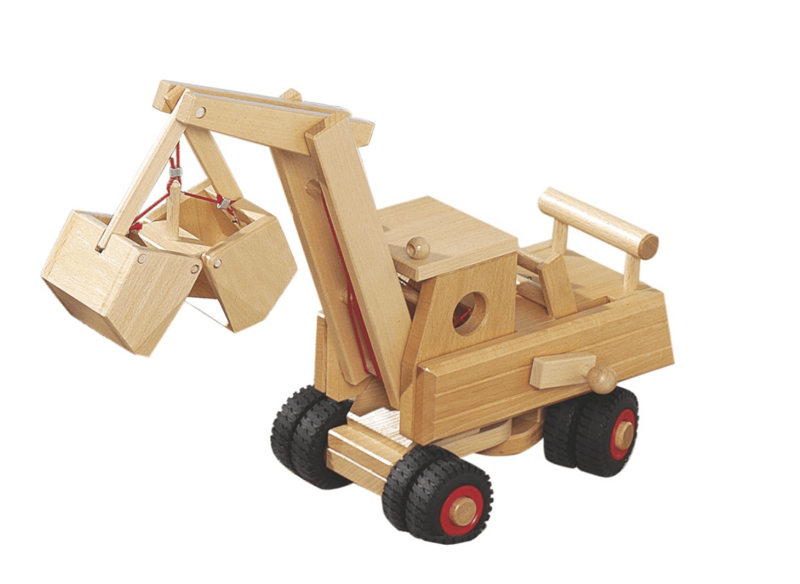 PlanToys has gained recognition globally through their policies and beautifully crafted wooden toys. I also really love how this dollhouse has an open floor plan and is made of two units that can be moved around to create new configurations leading to more open-ended play. 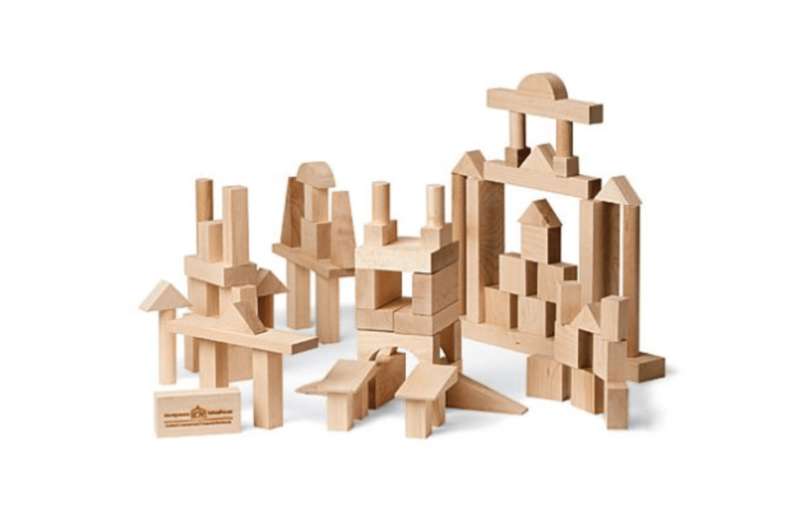 Wooden blocks are the best eco-friendly toys for both girls and boys. As a preschool teacher, I witnessed children time and time again return to the wooden blocks with endless creativity. With my own children, I have witnessed the same set of blocks purchased 14 years ago continue to be used. They will be used by my grandchildren too. You just can’t go wrong with wooden blocks! My Best Blocks by Maple Landmark are made in the USA. These blocks are “crafted from locally sourced, sustainably harvested maple hardwood” unlike many blocks that made overseas. Did you know that many commercial crayons contain asbestos? Not only are natural beeswax crayons safer for your child to use, they are joyous in texture and ease. 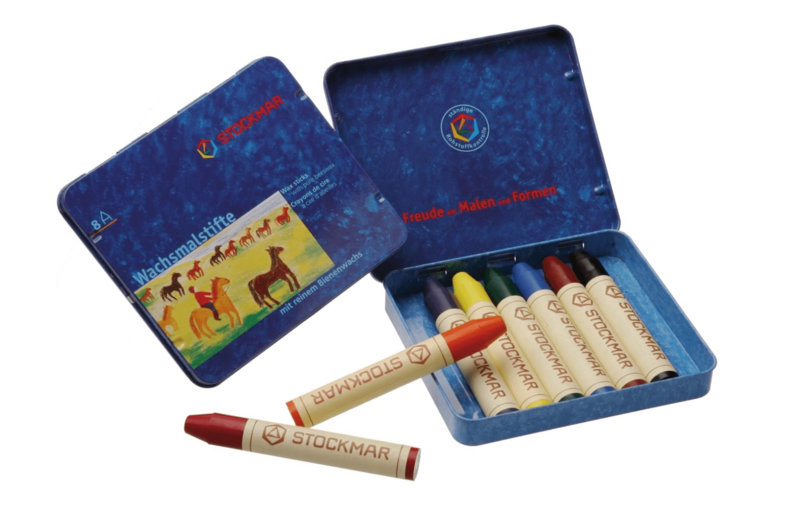 Stockmar beeswax crayons are made in Germany. These crayons are perfect for young children, as well as anyone who appreciates well-made art supplies.Used in Waldorf schools around the world. Because they’re made from wax containing all-natural beeswax, these eight crayons hold their light pigments exceptionally well, allowing you to create vibrant, colorful works of art with ease. The crayons are slightly larger than average, which makes them well suited for small hands to grasp. Set comes with handy crayon scraper. Set colors include carmine, orange, lemon yellow, green, blue, blue-violet, rust, and black. Stockmar products are certified nontoxic by the Art and Craft Materials Institute. These crayons are not just for little children. They were on my son’s back-to-school list of supplies for fifth grade at public school. The Stockmar logo combines the hexagonal form of a beehive with Goethe’s colour circle. Beeswax and colour: at Stockmar that is what it all comes down to. Stockmar really equates to beeswax, so closely is the firm associated with the bee product. Of course it is the main raw material used to make our candles, but it is also an important component in the wax-based paints and modelling beeswax. Beeswax is in fact crucially important to the paints. Both in the wax-based paints and in the modelling beeswax it is responsible for the characteristic transparent, glazed effect. These crayons are not 100% beeswax, and some people feel they are not as non-toxic as touted.3)http://themindfulhome.blogspot.com/2013/08/the-truth-about-stockmar-crayons.html The full ingredient list is available. They are still a much better choice than other crayons on the market manufactured in Asia from questionable ingredients without full disclosure. For eight years, we have had a recycled horse tire swing. This eco-friendly toy has amazingly stood the test of time in all kinds of weather. It still hangs in its original location. My kids had so much fun on this swing when they were younger. We tied an additional rope to it so that another child or adult can pull the horse back and forth. 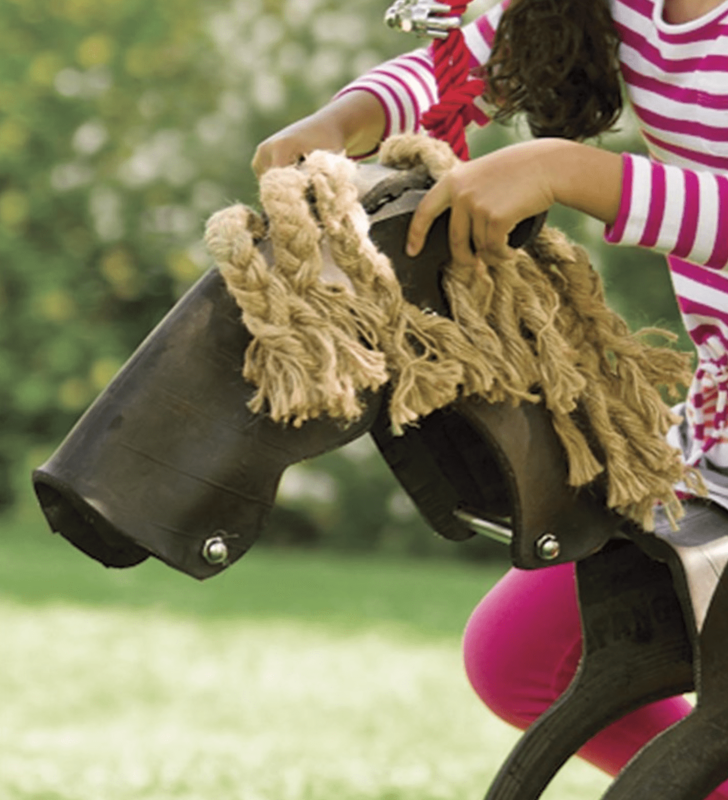 Another favorite activity is to twist the horse round and round, then let go and spin yourself dizzy. The toy is rated for ages five and up and for up to 200 pounds. Climb aboard this magnificent steed and let your imagination–and your spirits–soar! Crafted from eco-friendly recycled tires, the swing will arrive fully assembled and ready to hang with durable nylon rope. This is the coolest recycled tire toy I have ever seen. I do have some concerns about children playing with tires. There is not much research except involving the manufacturing of rubber tires and recycled tire crumbs used on playgrounds for cushioning. As a preschool teacher and mother, I always wanted a play loft for my children. Not only do they provide extra space for play, there is something about climbing higher that inspires creativity. 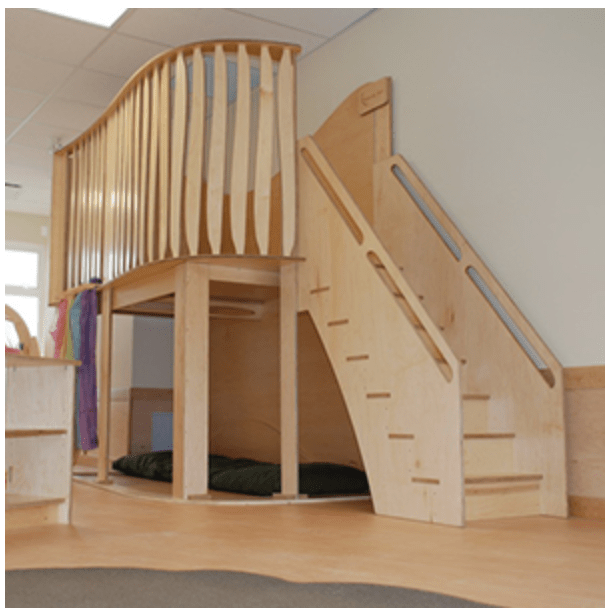 Play lofts are also great for developing gross motor skills. 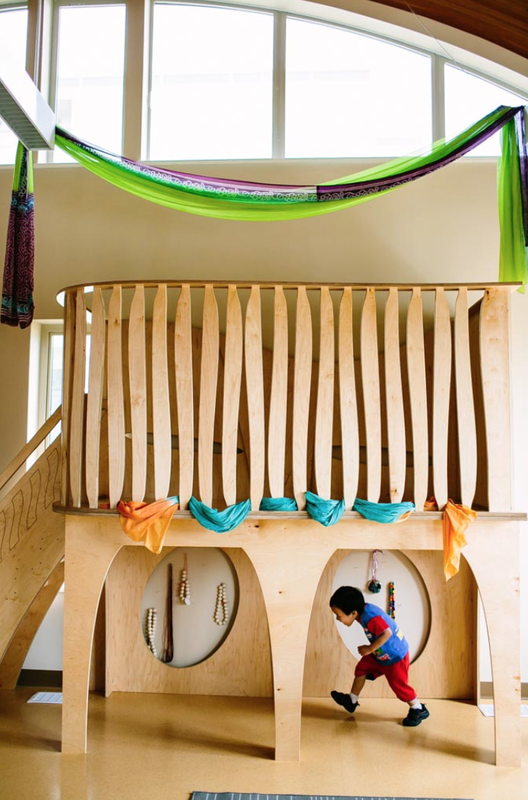 Natural Pod makes custom, eco-friendly play-lofts in Canada. Like many of the items featured in our eco-friendly toy list, this toy furniture will last a lifetime and cherished by generations. It is expensive, but not when you consider it longevity and environmental impact. All children like to play dress up, even my teenage daughter! Play silks are essential to fostering dramatic play involving dress up. Instead of pinning a child into a role, like princess or doctor, play silks allow for endless possibilities. They come in all shapes and sizes. Long ones are great for fort building; short ones are great for costuming. Playsilks, in the hands of children, are truly a bottomless toy chest. There are so many things that children will create with them. When playing dress-up, they will use playsilks to become pirates in one moment and birds in flight in another. Their size and texture make it easy for small hands to fold and tie. Their colors can inspire play using them as grass, sky, and water. Unfortunately, most silk is produced in China. In general, I avoid Chinese made products where possible do to social and environmental concerns. Just like most eco-friendly toys, you might go into sticker shock when you see the price of Fargus wooden trucks. But what truly is the cost when you consider these toys support handicapped individuals, are handmade, and will be cherished as family heirlooms? When you visit most little boy’s homes, you find them overbrimming with toy trucks. My home is no different. Instead of overflowing tubs, baskets, and closets of endless differently toys, eco-friendly or not, why not invest in less toys that are made in such a manner as Fargus? I love what this company is doing and what it represents! Many traditional toys are still the best eco-friendly toys. If you are crafty or have the time, you can make them yourself, but thankfully there are companies making these traditional, eco-friendly toys out of locally sourced wood. Stilts are fun for the whole family! They are great for balance and laughs! 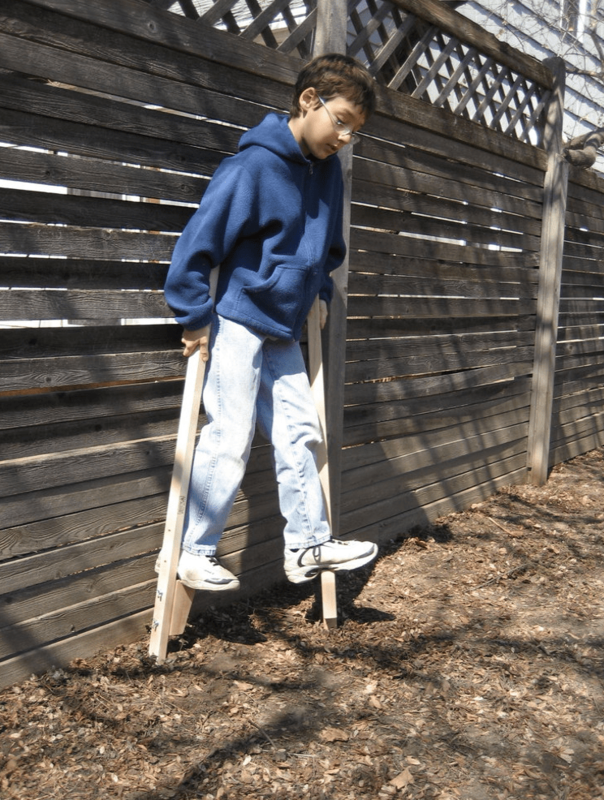 Stilt walking is challenging at first, but children learn a lot by perservering. What’s your favorite eco-friendly toy? Please share in the comments. « Green your Garage: Start with the Lube!